A car bomb explosion at a busy market near Baghdad has killed at least 30 people and wounded dozens of others. 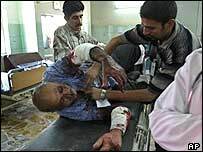 The blast took place in Nahrawan - a poor, mainly Shia town on the eastern outskirts of the Iraqi capital. More than 260 people, mostly Shia Muslims, have been killed in an upsurge of violence over the past four days. The militant leader Abu Musab al-Zarqawi has reportedly called for war against Shias ahead of next month's referendum on a new Iraqi constitution. Sunni groups have rejected the document, which is supported by Shias and Kurds. The latest attack came at a busy time after sunset, when many people would have been out shopping. A police spokesman said the car was parked near a stall in the middle of the square when it blew up,. About 38 people were wounded. Victims were taken to Baghdad's al-Kindi hospital, many of them transported in trucks and minivans. The Associated Press news agency says people lay bleeding on the hospital grounds, screaming in pain. Many had lost limbs. "I came with my brother Hamid, whose right leg was blown off below the knee," Alaa Mohammed told AP. Earlier, security forces found nine unidentified bodies in three separate places in Baghdad. All had been handcuffed and shot in the head and chest. The latest wave of violence began on Wednesday when 182 died. In the deadliest attack, a suicide bomber blew himself up amid a crowd of labourers in Baghdad. At least 50 people were killed in various blasts around Iraq on Thursday and Friday. The group led by Zarqawi said it carried out the attacks, warning they marked the beginning of a new campaign. The group has reportedly called for all-out war against Shias. The BBC's Richard Galpin in Baghdad says there is much concern about the safety of hundreds of thousands of Shia pilgrims who have started to converge on the holy city of Karbala, south of Baghdad, where a religious festival starts on Monday. A massive security operation is under way and hospitals have been put on alert across the region.